Initially established by the 767th AC&W Squadron as Lashup Radar Site L-44 on 27 Nov 1950 on a site near the El Vado dam. Known variously as Los Alamos Lashup Radar Site and El Vado Lashup Radar Site it was established to provide radar coverage for the nearby Los Alamos nuclear facilities. Sources differ on exactly when this temporary site was abandoned and the new permanent site, designated LP-8 became operational. It appears that the new site was operational by September 1952 and on 1 Dec 1953 the new site was named Tierra Amarilla Air Force Station with a Permanent ID of L-8. Initial equipment at the first lashup site included the CPS-5 search radar. After the move to the new site an FPS-3 and FPS-5 were in operation in 1953. The FPS-5 was said to have been replaced about 1957 by an FPS-6 height-finder radar. Available information on the FPS-5 indicates that it was a search radar so this seems unlikely. The physical plant of the site was divided into the main site, a cantonment area, a housing area, a trailer park and two radio sites. The main site housed the operations buildings, the radar towers, and the backup generators. The cantonment area housed the enlisted barracks, the bachelor officer's quarters, the orderly room, the dining hall, the motor pool and other support buildings. Apart and distant from the main site was a small housing area for critical married personnel. The housing area seems to have been located at or near the original site location by El Vado Dam. Two separate Ground to Air Transmitter/Receiver (GATR) radio sites housed the radio equipment for directing aircraft intercepts. 1 Jan 1951 - Assigned at El Vado, NM, as the 540th AC&W Group. 1 May 1951 - Transferred to 34th Air Division. 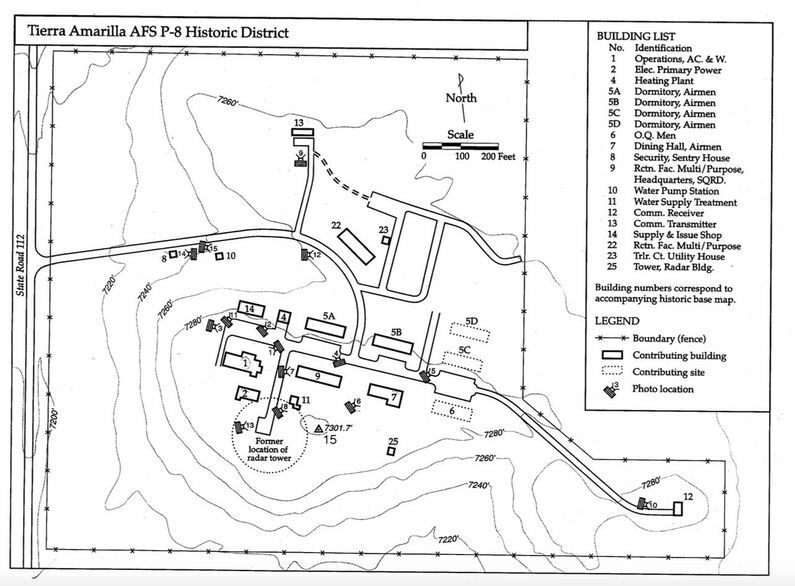 1 Dec 1953 - Site redesignated to Tierra Amarilla AFS, NM. 8 Feb 1959 - Inactivated. Abandoned sites near El Vado Dam and Tierra Amarilla, Rio Arriba County, New Mexico. The site at El Vado Dam appears to have been overbuilt with private housing. Location: Tierra Amarilla in Rio Arriba County, New Mexico. Cornett, Lloyd H. & Johnson, Mildred W., A Handbook of Aerospace Defense Organization (1946-1980), Office of History ADC, Peterson AFB, Colorado, 31 Dec 1980, 179 pages, Pdf, page 101. Winkler, David F., Searching the Skies: the Legacy of the United States Cold War Defense Radar Program, USAF Hq Air Combat Command, 1997, 192 pages, Pdf, page 139. Re-use Study for Tierra Amarilla AFS P-8 Radar Site Historic District, 23 Sep 2003, Cherry/See Architects for the New Mexico Historic Preservation Division pdf. This page was last modified 21:05, 7 January 2019 by John Stanton.